Check the Teaser for Cheerleader Karate School! It’s Perky Chicks and Roundhouse Kicks when the girls of Cheerleader Karate School burst on to the scene to save us from any and all evil. Party Girl: The Series to start May 11! Rest assured, it will be here before you know it and it will be awesome. The Promo that Saved Christmas…. …OK OK, my Christmas actually fairly good for the most part outside of some of the usual things that happen that tend to bring down the day. But I have to let go and I let God and hope those will get sorted. 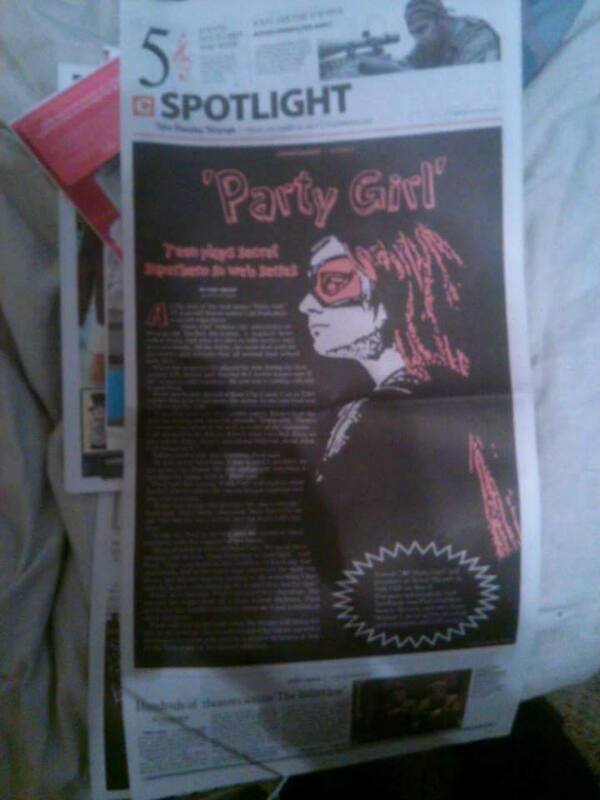 This day came with the arrival of a story about Party Girl in the Tyler Morning Telegraph. Dec. 26th edition of the Tyler Morning Telegraph. Our new lead actress, the phenomenal CAIT POOL is an Athens native. Athens is withing the paper’s coverage area which set her up to be a subject of a story. We met the man behind the story and photos, CORY MCCOY, while at the Tyler Rose City Comic Con doing promo work for the show. It was the first time we really got out to the masses to promote the show and it was well received and we made contacts we otherwise would not be able to had we not attended the con. Cory visited us on set a few weeks ago when we were filming scenes from the first episode of the second season. In the days after, he had said the story might not be printed until early next year, but not so. It’s out and can be read both online and in print: Teen Plays Secret Superhero in Web Series. Eternally grateful to Cory for the write up. Hopefully this is the first of many more to come. And trust us, it will be. The hype train is real and we will be chugging along, grinding every day leading up to the second season premiere in MAY, 2015 and beyond! Tyler TX and Web Series of the Week! Well a few things happened this past weekend, a very very busy weekend. Myself and the family alongside Cait Pool, her sister Caly and their mother Deidre set up shop at the Tyler Rose City Comic Con to promote the Party Girl web series. This was to be the first foray into really promoting the show outside of posting on the usual Facebook and Twitter. We didn’t know what to expect. 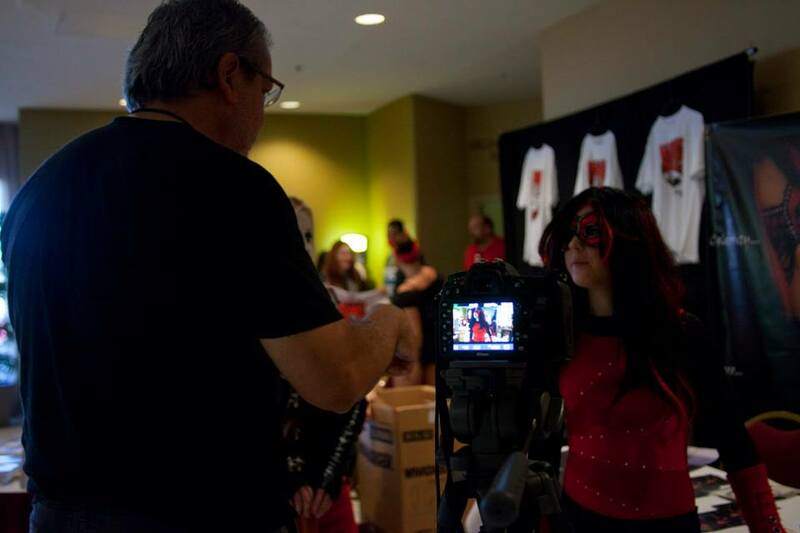 Miguel Angel Rivas putting the camera on Cait at the Tyler Rose City Comic Con. The con is in it’s second year and while it is still in its infancy, it amassed a big number of people. Lots of people to learn about the show, so we were excited for that. The table we had we originally set up inside the vendor area, but a scheduling and arrangement snafu put us outside, next to the popcorn guy. BUT, next to the ticket table so we were the first thing people would see after they got their tickets and the last thing they saw before they left. In hindsight, that was the best spot and I will actually be requesting that next year. 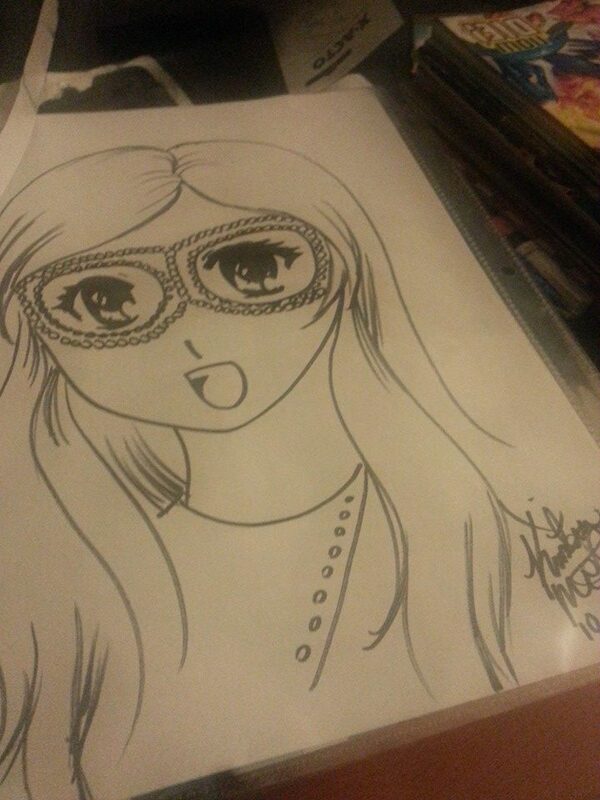 Party Girl manga-fied courtesy of artist/voice over artist Kristen McGuire. a lot of those people who came by the table again (of course because they have to pass us to get in the vendor area), a lot of them said they had checked out the show or had at least tried to check out the show and had wifi issues in their rooms. But at least people were seeing it and that, in the end, was the goal of all goals. To have fun, which I did, especially cosplaying Luke Cage, old school Luke Cage at that. I believe Cait and Caly had a good time as well and we reached more people, made contacts and more. There’s a candy store franchise opening in Frisco that is looking to have Cait on hand in costume for their grand opening. Good stuff. But we can’t be content. We have to keep going, keep grinding and keep getting more results like that. Speaking of results, the results came in on the Indie Series Network’s Web Series of the Week for Oct. 12-18. Party Girl won best web series for Chapter XIII and Jenni, DJ and Ada came in top four or better in categories for favorite male, favorite female and favorite couple/duo. Had I known about this particular site sooner I could have made it aware of Party Girl and got in the runnings for other weeks. And I think we would have done well. Live and learn, onward and grind. We have the North Texas Comic Book Show Nov. 15 as well an event at Roll2Play in Coppell the same day. Have to figure out the best way to handle those events, but again, more people and more opportunities to get people to know about the show and you can’t go wrong with that. Vote Party Girl Web Series of the week on Indie Series Network! It’s a weekly poll for Indie Series of the Week, also they have other categories..favorite actor of the week, favorite actress of the week, favorite couple/duo of the week. The eligible episode for Party Girl is Chapter XIII. Hit the site and vote. And I think for the write in categories if you watch the episode..Ada Perez..Den J Economou Jenni Tonge Mabrey Jacob Drum and Jeanne Lampley, Kyler Hodson, hell everyone shines. Let’s see if we can’t bring some good praise to the show! Vote, share and get others to vote! Deadline is Wednesday, 10/22!! Party Girl Web Series Chapter X is live! Check out the show! Like it! Share it! Comment on it! Help us get the show out there! Party Girl Web Series Chapter VIII “For My Sister” is live! The newest chapter of the Party Girl Web Series is live and can be seen below. We are sprinting through the rest of season one and closer to the first look at season two which will be at FenCon XI in Dallas this year. Also, look for the Party Girl Web Series to make an appearance at the 3rd Annual Lake Charles Film and Music Festival, Oct. 10-12 in Lake Charles, LA! When Rachel tries to help her sister, Michelle, with a story about a thief visiting Pyramid City she gets much more than she bargained for. Any feedback of any kind feel free to comment below or e-mail taurianfilms@gmail.com. Like the vid and share it with friends, family, everyone, let’s get everyone talking about Party Girl! For more vids on the series check out the links below!